La Résidence Belledonne Courchevel, Hotel France. Limited Time Offer! La Résidence Belledonne. "La Résidence Belledonne" is an apart-hotel. 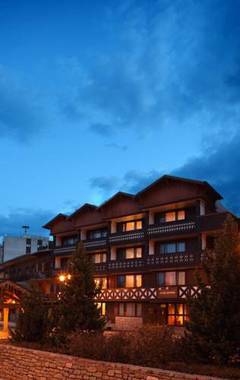 The residence has received 3 stars and the apart-hotel is situated in Courchevel. For visitors who like sports, this residence offers skiing. The accommodation has its own restaurant which is known for its American specialty. Visitors can connect to the Internet at no extra charge. With a mountain location in the heights of Courchevel, Les Brigues offers a range of fully furnished apartments with balcony and sweeping views overlooking a splendid natural mountain setting.